James was son of King James IV of Scotland and his wife Margaret Tudor, a daughter of Henry VII of England, and was the only legitimate child of James IV to survive infancy. He was born on 10 April 1512, at Linlithgow Palace, Linlithgowshire and christened the next day, receiving the titles Duke of Rothesay and Prince and Great Steward of Scotland. He became king at just seventeen months old when his father was killed at the Battle of Flodden Field on 9 September 1513. In 1525, Archibald Douglas, 6th Earl of Angus, the young king's stepfather, took custody of James and held him as a virtual prisoner for three years, exercising power on his behalf. There were several attempts made to free the young King – one by Walter Scott of Branxholme and Buccleuch, who ambushed the King's forces on 25 July 1526 at the battle of Melrose, and was routed off the field. Another attempt later that year, on 4 Sept at the battle of Linlithgow Bridge, failed again to relieve the King from the clutches of Angus. When James and his mother came to Edinburgh on 20 November 1526, she stayed in the chambers at Holyroodhouse, which Albany had used, and James used the rooms above. In February 1527, Henry Fitzroy, Duke of Richmond, gave James twenty hunting hounds and a huntsman. Magnus thought the Scottish servant sent to Sheriff Hutton Castle for the dogs was intended to note the form and fashion of the Duke's household, for emulation in Scotland. James finally escaped from Angus's care in 1528 and assumed the reins of government himself. The first action James took as king was to remove Angus from the scene. The Douglas family were forced into exile and James besieged their castle at Tantallon. He then subdued the Border rebels and the chiefs of the Western Isles. As well as taking advice from his nobility and using the services of the Duke of Albany in France and at Rome, James had a team of professional lawyers and diplomats, including Adam Otterburn and Thomas Erskine of Haltoun. Even his pursemaster and yeoman of the wardrobe, John Tennent of Listonschiels, was sent on an errand to England, though he got a frosty reception. The ruins of James' palace in the French Renaissance style at Falkland. According to 16th-century writers, his treasurer James Kirkcaldy of Grange tried to persuade James against the persecution of Protestants and to meet Henry VIII at York. Although Henry VIII sent his tapestries to York in September 1541 ahead of a meeting, James did not come. The lack of commitment to this meeting was regarded by English observers as a sign that Scotland was firmly allied to France and Catholicism, particularly by the influence of Cardinal Beaton, Keeper of the Privy Seal, and as a cause for war. Portrait of James aged around 25, by Corneille de Lyon. 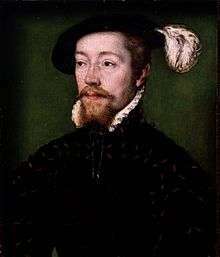 As early as August 1517, a clause of the Treaty of Rouen provided that if the Auld Alliance between France and Scotland was maintained, James should have a French royal bride. Yet the daughters of Francis I of France were promised elsewhere or sickly. Perhaps to remind Francis of his obligations, James's envoys began negotiations for his marriage elsewhere from the summer of 1529, both to Catherine de'Medici, the Duchess of Urbino, and Mary of Austria, Queen of Hungary, the sister of Holy Roman Emperor Charles V. But plans changed. In February 1533, two French ambassadors, Guillaume du Bellay, sieur de Langes, and Etienne de Laigue, sieur de Beauvais, who had just been in Scotland, told the Venetian ambassador in London that James was thinking of marrying Christina of Denmark. Madeleine did not enjoy good health. In fact, she was consumptive and died soon after arrival in Scotland in July 1537. Spies told Thomas Clifford, the Captain of Berwick, that James omitted "all manner of pastime and pleasure," but continually oversaw the maintenance of his guns, going twice a week secretly to Dunbar Castle with six companions. 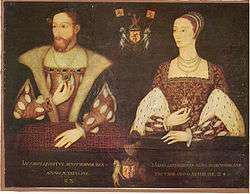 James then proceeded to marry Mary of Guise, daughter of Claude, Duke of Guise, and widow of Louis II d'Orléans, Duke of Longueville, by proxy on 12 June 1538. Mary already had two sons from her first marriage, and the union produced two sons. However, both died in April 1541, just eight days after baby Robert was baptised. Their daughter and James's only surviving legitimate child, Mary, was born in 1542 at Linlithgow Palace. According to legend, James was nicknamed "King of the Commons" as he would sometimes travel around Scotland disguised as a common man, describing himself as the "Gudeman of Ballengeich" ('Gudeman' means 'landlord' or 'farmer', and 'Ballengeich' was the nickname of a road next to Stirling Castle – meaning 'windy pass' in Gaelic). James was also a keen lute player. In 1562 Sir Thomas Wood reported that James had "a singular good ear and could sing that he had never seen before" (sight-read), but his voice was "rawky" and "harske." At court, James maintained a band of Italian musicians who adopted the name Drummond. These were joined for the winter of 1529/30 by a musician and diplomat sent by the Duke of Milan, Thomas de Averencia de Brescia, probably a lutenist. The historian Andrea Thomas makes a useful distinction between the loud music provided at ceremonies and processionals and instruments employed for more private occasions or worship; the music fyne described by Helena Mennie Shire. This quieter music included a consort of viols played by four Frenchmen led by Jacques Columbell. It seems certain that David Peebles wrote music for James V and probable that the Scottish composer Robert Carver was in royal employ, though evidence is lacking. James was with his army at Lauder on 31 October 1542. Although he hoped to invade England, his nobles were reluctant. He returned to Edinburgh, on the way writing a letter in French to his wife from Falahill mentioning he had three days of illness. Next month his army suffered a serious defeat at the Battle of Solway Moss. He took ill shortly after this, on 6 December; by some accounts this was a nervous collapse caused by the defeat, and he may have died from the grief. Although some historians consider that it may just have been an ordinary fever. John Knox later described his final movements in Fife. Whatever the cause of his illness, James was on his deathbed at Falkland Palace when his only surviving legitimate child, a girl, was born. Sir George Douglas of Pittendreich brought the news of the king's death to Berwick. He said James died at midnight on Thursday 15 December; the king was talking but delirious and spoke no "wise words." According to George Douglas in his delirium James lamented the capture of his banner and Oliver Sinclair at Solway Moss more than his other losses. An English chronicler suggested another cause of the king's grief was his discomfort on hearing of the murder of the English Somerset Herald, Thomas Trahern, at Dunbar. James was buried at Holyrood Abbey in Edinburgh. Before he died, he is reported to have said, "it came wi a lass, it'll gang wi a lass" (meaning "It began with a girl and it will end with a girl"). This was either a reference to the Stewart dynasty's accession to the throne through Marjorie Bruce, daughter of Robert the Bruce or to the medieval origin myth of the Scots nation, recorded in the Scotichronicon in which the Scots people are descended from the Princess Scota. Margaret Stewart, Lady Margaret Drummond, daughter of John Drummond, 1st Lord of Drummond. Scott, Sir Walter, The Lady of the Lake, a Romantic narrative poem published in 1810 set in the Trossachs. He appears in disguise. The poem was tremendously influential in the nineteenth century, and inspired the Highland Revival. Scott, Sir Walter, "Johnnie Armstrong", a ballad relating the story of Scottish raider and folk-hero Johnnie Armstrong of Gilnockie, who was captured and hanged by King James V in 1530. Gioachino Rossini, La Donna del Lago, an opera based on Scott's poem. Sung in Italian, James V is sung as "Giacomo V". ↑ Mackay, Æneas (1892). "James V of Scots". In Lee, Sidney. Dictionary of National Biography. 29. London: Smith, Elder & Co. pp. 153–161. ↑ Hadley Williams, Janet, in Mapstone, Sally ed., William Dunbar, The Nobill Poet, Tuckwell (2001), p.95: Craigie, WA ed., Maitland Folio Manuscript, Scottish Text Society, (1919), 247. ↑ State Papers Henry VIII, vol. 4 part 4 (1836), 209, Magnus & Radclyff to Wolsey, 2 Nov. 1524: cf. Letters & Papers Henry VIII, vol.4 (1875) no.830: 15 Nov. 1524: Ellis, Henry, ed., Original Letters Illustrative of English History, 1st Series, vol. 1 (1825), 251–252. ↑ State Papers Henry VIII, vol. 4 part 4 (1836), 460, Christopher Dacre to Lord Dacre. ↑ Thomas, Andrea, Princelie Majestie, John Donald (2005), 12–15, 36: Murray, Atholl, 'Pursemaster's Accounts', Miscellany of the Scottish History Society, vol. 10, (1965), 13–51. 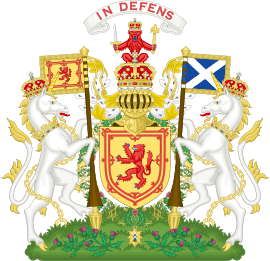 ↑ Historic Manuscripts Commission, Earl of Mar & Kellie at Alloa House, (1904), 15, Will 12 June 1540: Cameron, Jamie, James V, Tuckwell (1998), 245–248. ↑ Amongst references to the royal sheep, after James's death 600 were given to James Douglass of Drumlanrig), HMC 15th report and appendix, part viii, Duke of Buccleuch, (1897), 17, 6 January 1543. ↑ Cameron, Jamie, James V, Tuckwell (1998), 260. ↑ Accounts of the Lord High Treasurer of Scotland, vol.6 (1905), p.236. ↑ Hay, Denys, ed., Letters of James V, HMSO (1954), 328:Reid, John J., 'The Scottish Regalia', PSAS, 9 December (1889), 28: this sword is lost. ↑ Accounts of the Lord High Treasurer of Scotland, vol. 7 (1907), 18. ↑ Steuart, A. Francis, ed., Memoirs of Sir James Melville of Halhill, Routledge (1929), 14–17. ↑ Thomas D'Arcy McGee (1862), A Popular History of Ireland: from the Earliest Period to the Emancipation of the Catholics, Book VII, Chapter III. ↑ Hay, Denys, Letters of James V, HMSO (1954), 51–52. ↑ Calendar of State Papers Venice, vol. 4 (1871), no.861. ↑ State Papers Henry VIII, vol.5 part 4 cont. (1836), pp.59–60. ↑ Cameron, Jamie, James V, Tuckwell (1998), 131. ↑ Hollingsworth, Mary, The Cardinal's Hat, Profile Books, (2004), 117. ↑ Leproux, Guy-Michel, La peinture à Paris sous le règne de François Ier, Sorbonne (2001), 26. ↑ Robertson, Joseph, Inventaires de la Royne d'Ecosse, Bannatyne Club, (1863), xii–xiii, note citing Thomson, Collection of Royal Inventories, (1815), 80–1. ↑ Teulet, Piéces et documents inédits relatifs a l'histoire d'Ècosse, Bannatyne Club (1852), 122–5. ↑ Accounts of the Lord High Treasurer, vol. 7 (1907), 24. ↑ Letters & Papers Henry VIII, vol. 12 part 1 (1890), nos. 1237–8, 1256, 1286, 1307. ↑ State Papers Henry VIII, vol.5 part IV cont., (1836) pp.94–95, Clifford to Henry VIII, 26 July 1537. ↑ Black, Picturesque Tourist of Scotland, pp. 180–1 . ↑ "The Court of Mary, Queen of Scots". BBC Radio 3. 28 February 2010. ↑ Hay, Denys, ed., Letters of James V, HMSO (1954), 163, 169, 170: Shire, Helena M., in Stewart Style, Tuckwell (1996), 129–133. ↑ Thomas, Andrea, Princelie Majestie, John Donald (1998), 105–7. ↑ Drummond of Hawthorden, William, Works, Edinburgh (1711), 115. ↑ George, Eyre-Todd (1892). Scottish Poetry of the Sixteenth Century. Glasgow: W. Hodge and Co. pp. 139...182. ↑ Ferrerio, Giovanni, De vera cometae significatione contra astrologorum omnium vanitatem. Libellus, nuper natus et aeditus, Paris , Vascovan, (1538). ↑ Thomas, Andrea, Princelie Majestie, the court of James V, John Donald, (2005), 226–243. ↑ Lindsay of Pitscottie, Robert, The History of Scotland, Edinburgh, (1778), 238: abbreviated in Lindsay of Pitscottie, vol. 2, (1814), 359. ↑ Accounts of the Masters of Work, vol. 1, HMSO (1957), 101–102, 242 290: Thomas Andrea, Princelie Majestie, John Donald (2005), 173. ↑ Accounts of the Lord High Treasurer of Scotland, vol. 7 (1907), 95, 287 (taslet), 357 fireworks: Balcarres Papers, vol. 1, SHS (1923), 18, 20. ↑ Letters & Papers Henry VIII, vol. 14 part 1, (1894), xix, no. 406: vol. 14 part 2, (1895), no. 781. ↑ Calendar State Papers Spanish, 1542–1543, vol.6 part 2, London (1895), p.144, no.66. ↑ Strickland, Agnes, Lives of the queens of Scotland and English princesses, vol. 1, Blackwood (1850), 402 part translated only; now preserved as National Archives of Scotland SP13/27. ↑ Knox, John, "from History of the Reformation, book 2,". ↑ Bain, JS., ed., The Hamilton Papers, vol. 1, Edinburgh, (1890) 336–339. ↑ Grafton's Chronicle, vol. ii, London (1809), 488. ↑ The Scots Peerage, vol. I, p. 155. ↑ Thomas, Andrea, 'Women at the Court of James V' in Ewan & Meikle ed., Women in Scotland, c.1100-c.1750, Tuckwell (1999), 86 citing the chronicles of George Buchanan, Robert Lindsay of Pitscottie, and David Lindsay's Complaynt of Scotland. ↑ Williams, Janet Hadley ed., Sir David Lyndsay, Selected Poems, Glasgow (2000), 98–100, 257–9. ↑ Dictionary of National Biography. Retrieved 7 August 2016. ↑ Clouston, J Storer (1919). "Some further early Orkney armorials" (PDF). PSAS. UK: AHDS. p. 186. .
↑ Lee, Sidney, ed. (1898). "Stewart, John (1531-1563)". Dictionary of National Biography. 54. London: Smith, Elder & Co. : James Somerville, Memorie of the Somervilles, vol.1 (1815), pp.385–9, has 'Katherine' Carmichael. ↑ Register of the Privy Seal, vol. 8 (1982), 485, no. 2742. This article incorporates text from a publication now in the public domain: Wood, James, ed. (1907). "James V". The Nuttall Encyclopædia. London and New York: Frederick Warne.